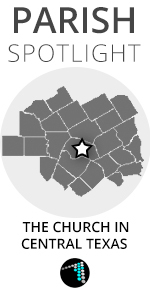 This piece is one of a series in which ACNM is featuring different parishes of the Austin Diocese, so we can all get to know one another better, increase our sense of community, and grow in unity. This is what my youngest daughter, Roise, has said, almost every time we’ve stepped into the prettiest place in town, St. Anthony’s Catholic Church in Bryan. It was here that I found myself, inexplicably, every day for daily mass when I was 20. Mass was very strange to me, having been raised without religion at all. Eventually I was baptized, confirmed, and received first Holy Communion at a daily mass at St. Anthony’s in 1990. My bemused family was there. My Catholic fiancee wept with joy, and all the cool old ladies in the front row hugged and kissed me. I was married there later that same year. St. Anthony’s is a place in my heart, as well as a physical place. I think the town of Bryan would say the same. St. Anthony’s (named for St. Anthony of Padua) was founded in 1896 by 100 Italian families, mostly from the villages of Corleone and Poggioreale in Sicily. It was the second Catholic Church in Bryan-College Station, the first being St. Joseph’s. Though St. Anthony’s today is multi-cultural, many of the names that fill the historic Catholic cemetery, Mt. Calvary, in Bryan, are some of the same family names you will hear at St. Anthony’s now; Scarmardo, Ruffino, Patronella, Palasota, Fazzino, and Lampo, are just a few of them. These Italian names are still names of some of the businesses, and streets of our town. They are woven into our history, part of our life, as so many of the descendants of those founding families are still with us here. At St. Anthony’s, the people are devout, kindly, and gentle, in my experience; in the deep -down- good kind of way you would hope for in a small town church. Most of the people praying there before mass will look back and smile when they hear you come in, giving you a friendly nod. St. Anthony’s is the mother parish of the legendary little San Salvador Mission in the countryside outside of Bryan. Mass is still held there on the first Saturdays of the month. The parish has a strong religious education program, a Bible study, adult faith formation, youth ministry, men’s club, Altar Society, Mother’s Day Out program, a meal ministry, a yearly bazaar and picnic, and is generally a very lively place. There is a re-enacted Stations of the Cross by the youth group that processes through the neighborhood every year on Good Friday. Some families still make traditional Italian St. Joseph altars, often in thanksgiving, if they have promised one to St. Joseph in response to prayers answered. When his feast day is coming up, people will get to hear there is an altar and thousands, (yes, I’m serious,) will come from all around. The family and friends hosting the St. Joseph altar will cook for days in preparation. All are welcome. Some years there are no St. Joseph altars. Some years there are several, and one can make a tour of the different houses where the celebrations are being held. These occasions are also considered a chance to share with the less fortunate. The tradition of these St. Joseph altars originated in Sicily, of which St. Joseph is the patron saint, and have several interesting customs associated with them that are still practiced here today. There is a not to be missed St. Anthony’s Altar Society spaghetti dinner (the first one was in 1938) every year on the second Sunday in February. The cooks usually feed up to 3,000 people! St. Anthony’s has renovated its parish center recently. It was re-named for the beloved Monsignor John Malinowski who served as pastor of St. Anthony’s from from 1973-1996. He still helps out now and then and stays in touch, though he spends most of his time as the Chaplain of St. Joseph’s Hospital here in Bryan. Notably, St. Anthony’s is the home parish of the much loved, now Bishop of San Angelo, Mike Sis, who was also pastor of St. Mary’s Catholic Church in College Station for 13.5 years. There is a gym for the kids, a lovely Eucharistic chapel, a pavilion and fair grounds outside town. As it has grown over the years, St. Anthony’s has come to own the whole block! The parish is made up of about 700 families. Should you wish to visit St. Anthony’s, it is at 308 South Parker in the lately revitalized historic downtown Bryan. Its presence is at the heart of our town, in every way. Special thanks to Becky Scamardo, Judy (Scarmardo) Carmeaux, and Denise Degelia DeLuke for helping me with this post, and to my daughter, Roise, for her photography.